This week as I celebrate my 55th birthday, I wanted to do something to make some impact. Oh sure, I’m excited about the possibility of lower prices at Denny’s, but in the grand scheme of things there are more profound legacies to pursue than a cheaper Grand Slam Breakfast. So, I’m going to use this year’s milestone birthday to hopefully benefit the work of Loving One by One in Uganda (LOBO). New Creation Center (NCC) is a primary school located in Kampala, Uganda, operated by Loving One by One Ministries (LOBO). It’s roughly the equivalent of what we would call a “K-8th” school here in the U.S. But that’s where the similarities stop – there’s nothing quite like this school in the U.S. Children who are accepted into this private Christian school attend FREE of tuition. Not that it doesn’t cost anything to educate these children; it’s just that the costs are paid by various sponsors in the United States and elsewhere. Typical sponsors have either found out about NCC firsthand during a trip to help LOBO in Uganda (as I did), or they’ve found out from friends or family who have visited Uganda. Here’s the quick scoop on NCC and why it’s necessary. In Uganda, public school costs around $30 a month, give or take. So while everyone is “entitled” to go to school, not everyone goes, because in a country where the average family survives on about $1.25 a day, $30 a month is pretty much all of it. Typically, if a family has a windfall of some sort (they sell a goat, they have a better than average crop, or some other unexpected inflow of cash), they’ll start their children in school. But quickly, between purchasing school supplies, clothing and paying the monthly fees, most students drop out fairly quickly. (Note – this is one of the ways I differ from a typical Ugandan… If I happen to sell a goat, I’d probably use the proceeds to buy a new ukulele or something. Not that I’ve ever sold a goat or even owned a goat, but I’m just saying. But that’s just me). Naturally, an important key to breaking the cycle of poverty from one generation to the next is a good education, from primary through secondary, and possibly on to some sort of college or technical training. All that is available in Uganda, but only affordable by very few. And so, the cycle of poverty continues. When a child is accepted into New Creation Center, that child is provided with a uniform and school supplies. He/she also receives two hot meals a day – pretty important, considering most Ugandan children aren’t guaranteed even one meal a day at home. For many of our NCC students, the two meals they get at school are their only meals. The cost, as I mentioned above, is paid for by sponsors in the States or elsewhere. People who see the importance of education, not just as something we take for granted, but literally as a difference between life and death – those people are the ones who commit to $20 a month to educate a child at New Creation Center. People like you, maybe? OK, you may want to guard your wallet. Actually, just relax and open it – because for $20 (that’s TWENTY DOLLARS) a month, you can change a child’s life, permanently. You can make a difference between marketable skills, vs. a lifetime of struggle and poverty. You can make a difference between children giving birth to other children far too young, vs. children learning to take responsibility for their lives and future families. Your $20 (TWENTY DOLLARS) a month means, literally, the difference between life and death. Our NCC kids want to become teachers. And doctors. And pastors. And attorneys. And musicians (yeah, baby). They’re aiming high, and most of them will reach their goals. Just to be clear, it’s not just $20 one time – it’s $20 a month, for the time it takes to get that kid through school. We’re talking several years. But how can we ask less? It would be unfair to start a child with a sponsor, and then have to tell that child he/she is no longer sponsored. So while the monthly cost is fairly low, please understand you’re in this for a while. Maybe this is something you can do on your own. Or maybe your children can pool a portion of their monthly allowances to sponsor a child together. Maybe a group from your church or school can take on a child or a few children. Or whatever – there are many ways to make this happen. 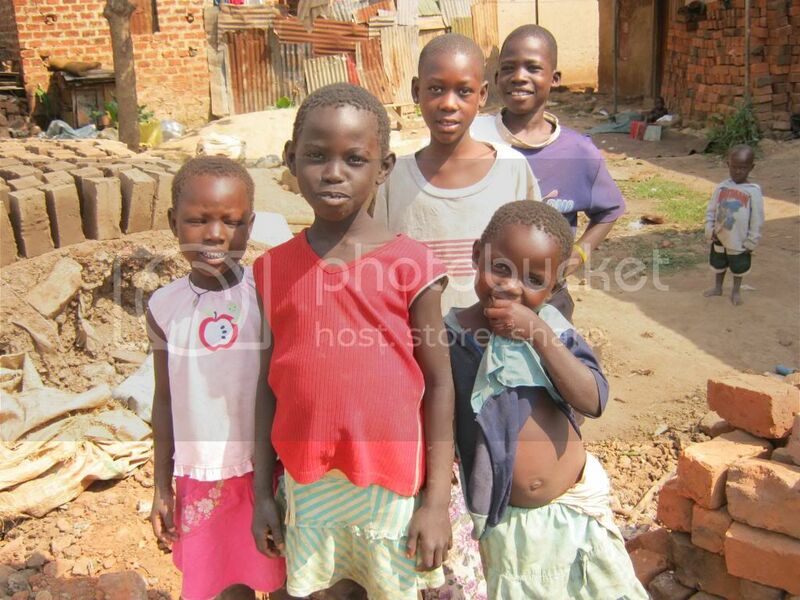 When you sponsor your Ugandan child, you will receive photos and occasional letters from that child. You can write to him. Or her. You can send small gifts if you want to. Your encouragement means everything, so communication is vital. And in some cases, you may be able to actually visit – more on that later this week when I write about participation on LOBO’s humanitarian teams. 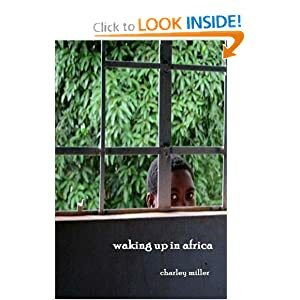 If this is something that appeals to you, please contact me at charley@charleymiller.net. I will put you in touch with Sherry Roberts of LOBO, and you’ll be on your way. There are several children at New Creation Center who need sponsors NOW. You can be one of them. If you appreciate the work at New Creation School, but that isn’t quite where your passion is, keep reading this blog this week to hear of other ways you can (and should) help Loving One by One. Tuesday – New Creation Family Home. Wednesday – The Hope Fund. Thursday – Future Expansion Projects. Friday – Participate on a Humanitarian Team by either going, or sending someone. 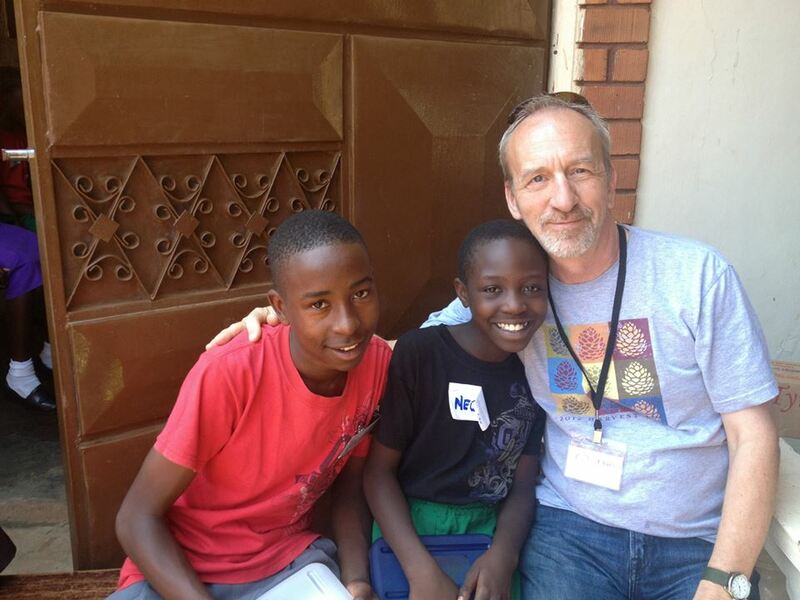 Thanks for helping me mark a milestone birthday by helping me serve others in Uganda. I’m looking forward to what happens this week! Above photo – Me and my two sponsored children… Jordan (left), Neonah (center), and me (the taller old white guy on the right).